Make sure you do it right by protecting your investment. This basic DIY procedure is shared by Campfire In A Can, originally written by CampingRoadTrip.com. – Water pump converter and WD-40A water heater bypass will be required, unless it’s already installed. Grab the owner’s manual and remember to review all the specifications, even if you have been prudent about maintaining your RV. Don’t forget that every RV is different in function and style, so some of us will require additional materials to perform this maintenance and alternate servicing techniques. It may be helpful to employ a partner to assist you during the maintenance process. Remove all in-line water filters. Empty out the fresh water tank and the hot water heater, allowing ample time for the water to cool after you have turned off the heater. Take out the drain plug and undo the pressure relief valve. Continuing with the draining process, empty out and flush the black and gray wastewater holding tanks. 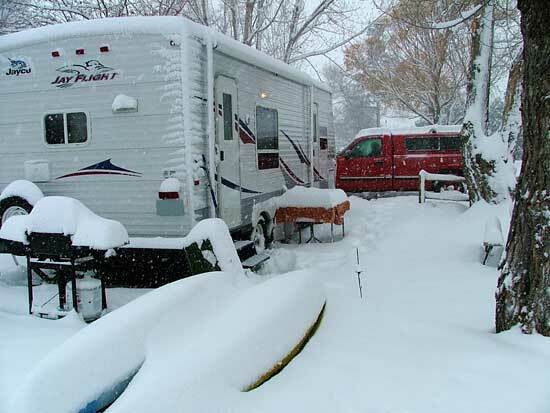 Some RVs have tank flushing systems; if yours does, use it. Clean the tanks of debris and remnants using your cleaning wands. Remember to leave the valves opened and apply the WD-40 to the termination valves. Attach the compressed air adapter to the fresh water inlet, setting the compressed air adapter to less than twenty pounds per square inch (PSI). Make sure to check each faucet one at a time, including the shower and toilet. The compressed air will remove any remaining water. Use the compressed air adapter to clear out the water heater. Replace the drain plug and shut the water heater bypass valve. Detach the compressed air adapter, storing it in a safe place. Attach the water pump converter, fastening the kit’s clear tubing to the pump’s inlet side. In the other side, pour the antifreeze. Turning on the water pump to pressurize the system. Check every cold and hot valve, opening each slowly until the antifreeze appears. Afterward, close each valve. Add additional antifreeze, if necessary. Make sure to remember to close the shower valves during this process. The toilet will need to be flushed until you see the antifreeze as well.